1 - history | grep "kahuna mode fiction game"
First I have to admit that I see myself primarily as a novelist, a book lover and trained librarian. I'm all into stories, narratives. But I also, and this might be how I differ from most of my colleagues, fell in love with my electronic prothesis, this symbol-twisting machine, and the text universe of the internet. As a member of the Chaos Computer Club (CCC), I firmly believe that "you can create art and beauty with a computer" , and since I first read William Gibson's "Neuromancer", hooked myself up on the net and discovered digital narratives in 1994 , I am still searching for ways of how to combine these two fascinating worlds. Okay, the hype is over now, back to basics. I first thought about - and actually built - the kahunaMUD (multiple user dimension, or dungeon) using the characters and rooms of the novel, as a space for readers to explore and live in, textually. Thus, it is actually a MOO (multiple user dimension, object oriented), programmed in perl, an online role-playing game in which people could gather and play out scenes from the novel or whatever personal character or story they would like to choose. The main problem with such a MOO is also its main advantage: that it is not static but an environment which only exists and can be accessed online. Another problem in setting up a MOO is to find a reliable server. Fortunately, liquidsteel.net agreed to support me with that. Jens Ohlig from the CCC introduced me to Infocom text adventures like Douglas Adams' "Hitchhiker's Guide to the Galaxy." I immediately got hooked, and thought about adopting this storytelling structure for my own project. Interactive fiction games were especially popular in the 80s, and work using almost the same linguistic structures like a MUD/MOO, yet they are closed (source), finite, and every possible turn of a story has to be considered and programmed by the author before publication. The best of those games manage to give you an illusion of real interactivity or communication, or know their players' expectations inside out, in order to subvert them as much as possible. At first, I taught myself the basic bits of Inform, the programming language of many of those games, and planned to create one together with Jens Ohlig. These inform files are simple ASCII files, which have to be compiled into z-files, which can be opened with free interpreters like Frotz or WinFrotz. What I did exactly could perhaps be best described as not only writing a screenplay but also having ot invent and develop a whole filming technique for it at the same time. Of course, this was largely my fault, due to my decision to not simply fall back on using ready-made software like Storyspace. Instead, I tried to develop my own writing engine, together with the programmer Jens Halm, using Macromedia Director's Shockwave technique and its own programming language, LINGO. Our plan was a bit mischievous. We took a mighty programming language like LINGO, normally used for high-end professional graphic interactive CD-ROM and internet projects, to re-invent the classic genre of the text adventures, with a more- accessable user-interface, to hint at a possible future of this genre. Sure, as a 2-man- band with hardly any budget or extra time on our hands at all, we had our limits. There are many ways I could think of of how one could further improve our concept. But I think that even in this basic form, which we decided to put on the net for free, one could enjoy and experience and get a first impression of how electronic narratives on the net could develop. For me as an author, the development of such a game also meant I had to sport some skills as a multimedia project manager who has to know and decide what can be done at all, regarding your manpower, technical equipment and financial resources aswell as time. So, my first task was to teach myself the basics of the Director's programme interface, within two hours. We decided to keep it all text-centered, even taking it so far as to let go of using the mouse completely and just offer a retro-style command-line instead. That way, we wanted to stress that we see the internet primarily as a text-centered medium, as is literature, and also give a more realistical experience of the "typing process." The "gaming aspects" like a help- and save-function, an intro and some game rules like an "aim" and some nifty special effects were included, because we wanted to stress the playfullness in the character of exploring this text adventure - and also give the reader a sense of security reminiscent of the experience of reading a book. So how does this game work? At the start, the player / reader finds himself in the role of Nadine, the main character from the novel, at the beginning of the story, in a dark room full of monitors you have to enter before joining the "real" story of your life. Your aim is to win your lover Ary's heart and to improve your kahuna powers (visualized by your kahuna level) and keep it. 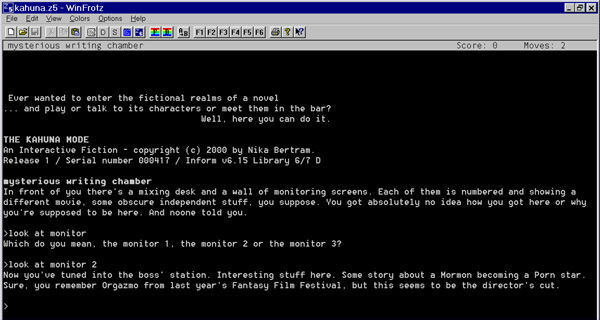 Each screen has some words highlighted which you can "do something" with, ie use a common verb out of the mud/text adventure- vocabulary like "look" or "take" in combination with the highlighted words, and thus get taken to another screen telling you more and leading you deeper into the story. The game's architecture was built around using the novel's story, characters, rooms and events as spaces and objects with coded properties, each of them being a "scripted narrative event within a scripted space." Of course, this also means that the basic critiques of text adventures as net-literature would still apply for this game: that this surface is only seemingly non-linear and open-ending or expandable, while the whole thing remains hidden from the reader's view. Yet it seems to me that you will always get this problem in dealing with hypertextual narratives as soon as you include any micro-narrative at all, because for this kind of fiction, structural "leadership" by some kind of author, is essential - as with "normal" novels published as a book. Or, in short: story-telling needs structure, a certain linear way of events. There are many ways in which I sympathize with Florian Cramer's theses about the problems of writing and developping really interesting internet literature. Because, in my case, in the beginning was "the buch", I had no intention to simply put its text on the net, but tried to create something using the means of the new media, as an experiment for me as a writer aswell, to, as Cramer wrote, "quit the mere observational view-point out of poetological curiosity". I also would reject any ambitions of calling my project "avantgardistic," but stress its experimental state, as a guinea pig, based in its creation on my own theories on possible digital fiction. is programming code = writing literature? What is literature, then? As a member of the Chaos Computer Club, I know many code poets who seem to be obsessed with coding languages not unlike the way novelists are obsessed with "real" language. The problem with that is, that, in order to develop such highly sophisticated skills, you would need a lifetime all of its own, which would make it hard to see yourself as a parttime novelist aswell, if you still need a day job. I am optimistic that we'll see many interesting coding projects and artworks in the future - if writers and coders cooperated even more than today. A study by Susana Pajares Tosca found out that gamers, even in role playing games, do not experience themselves as fictional characters. To them, the action part of the story, to do something, act, is more important than aesthetic pleasure of immersion or to follow a good-written story, like novel readers might do. You play every game in order to win, reach a certain aim. As the story of my game is based on a novel, and the aim of novel-reading is at best to gain experience, I decided to satirize this "rule" a bit, and "throw" the player into the role of my main character Nadine. Interestingly enough, some readers / players have remarked they enjoyed the transformation scenes in the novel more, because they found them almost unbearably real when playing the game, ie. they contradicted the results of the study. I am an old-fashioned believer in the power of words, and, to me, graphics and text (code) are all different means to communicate using sign language. Therefore, intermediality always seems to be inherent already in reading (digital) texts, comics or clicking your way through interactive CD-ROMs or websites. On the other hand, there's also always the danger of overdoing this media-mixing thing, and ignoring the possibilities of how to make the best use of each media seperately. It's always difficult to translate a story from one media to another. There's seldom a movie as good as its novel was. Or vice versa. It's important to use each medium for its best purpose. Publishing and reading a traditional novel as an e-book doesn't seem to make much sense, not if you know what you're missing: the smell of books. This is also why publications of socalled "cooperative projects" fail: they lose one dimension in print. To me it was very important to have the novel published independently as a "real book" - and concentrate on creating the game as a complete new project, with all text written anew from scratch (and also in English), based just on the story and not the narrative technique of the novel. ... has its limits. People do not always want to participate in constructing artworks themselves. Sometimes we just prefer to sit back and let others take our hands leading us to wonderlands. Getting asked and having to decide all the time what to do next also interrupts the flow of the story. This does not apply to games, as they are largely action-oriented (see above). Another myth: like John Barth points out, narratives always follow a certain time-line. Our own conscience, our receptive mode, also when reading, appears to be linear structured. To make the best out of real non-linear projects, we would have to be able to perceive things in a non-linear way. This, i believe, is something perhaps only Ais - or cyborgs / humans with "improved" brain structure - will ever be able to achieve. Up to then, we feel uneasy we'd miss all the fun when confronted with hypertexts. ... but might become a very important kind of literature, reflecting our postmodern condition and helping us in coping with things to come when, like Thomas Pynchon put it, "the curves of research and development in artificial intelligence, molecular biology and robotics all converge." Publishing digital literature will not improve your reputation as a "serious" literati. author: forget it. It just won't work. some c/c++ graphics programming and opt for the gaming business. Nika Bertram: Der Kahuna Modus. Eichborn.Berlin, 2001. [kahunamodus.de] This novel also seemed suitable for transformation into another medium because its main theme is transformation, and it also deals with stuff like gender, identity and all that postmodernist aftermath. It's also about computers and mythology, one could say, as in: what do you wish to be today? This quote taken from Steven Levy's Hackers: heroes of the computer revolution is also part of the hacker ethics of the CCC. For an excessive list to interactive text adventure programming, playing and theory, see: http://home1.gte.net/longrj2/infocom/reference.html. Unfortunately, the archive at gmd.de seems to have been taken down. I would have preferred to use non-proprietary open source software instead, yet I do not know of any such programme comparable to the features of Shockwave in the, say, LINUX/UNIX world. Besides, LINGO code is closely connected to Shockwave, and I was happy enough that LINGO expert Jens Halm offered to work in his sparetime for free on this project. One could, eg., include even more story paths, graphics, sounds, special effects, and anyone who would like to follow this path is very much welcomed by me. Or film director, as Mark Amerika once described his role. The programme uses some interesting voculabury like "stages, cast-members, scores." The expression "you can drag your cast-members on stage whenever you need them" enlighted my novelist's heart, of course, even if I was just responsible for the text-cast-members. Cramer, Florian: "Warum es zuwenig interessante Netzdichtung gibt. Neun Thesen." Cramer, Florian: "Kombinatorische Dichtung und Computernetzliteratur." Beitrag zum Forum Ästhetik Digitaler Literatur 2000 in Kassel, veröff. unter dichtung-digital. As I said, I know of the limits of my project. One way to improve it could be to integrate the features of a mud environment, like the ability to let readers enhance or improve text bits or include own graphics or other media or choose between different roles or viewpoints of the story. But these are questions of programming, and although it would have been possible to also include links leading "outside" of the game, this feature alone would have meant too many coding difficulties for our project to get realized. In: Dieter E. Zimmer: Die Bibliothek der Zukunft. Hamburg 2000, S. 57. Zit. aus: Daiber, Jürgen: �Ut pictura poesis� � oder: Ars poetica für Hyperfiction. In: Pynchon, Thomas: "Is it O.K. to be a luddite".